The dual arm system shown above has 25 powered DoF (37 total). It weighs about 23 kg (50 pounds) and can lift over 50 kg (110 pounds). HDT’s dual arm manipulators provide enhanced functional dexterity for many tasks, such as picking up boxes, opening containers, and using tools. First advantage of compliance – the arms are inherently safe for people to work around. If a robot and a person bump into each other, the robot’s compliance allows its arms to “give”, just like another person. Second advantage of compliance – the dual arm system can easily pick up a box or other large, heavy, or awkward object. 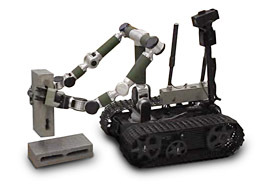 Just like a person, the robot’s arms can press on either side of the object with the minimum force needed to grasp it, and then move the object to another location. The Adroit dual arm system shown above is lifting a concrete block (see our video page. ).